Super Over. No-ball howler. Spirit of cricket variance. Exhilarating hitting, brilliant comebacks, heart-wrenching collapses and what not. 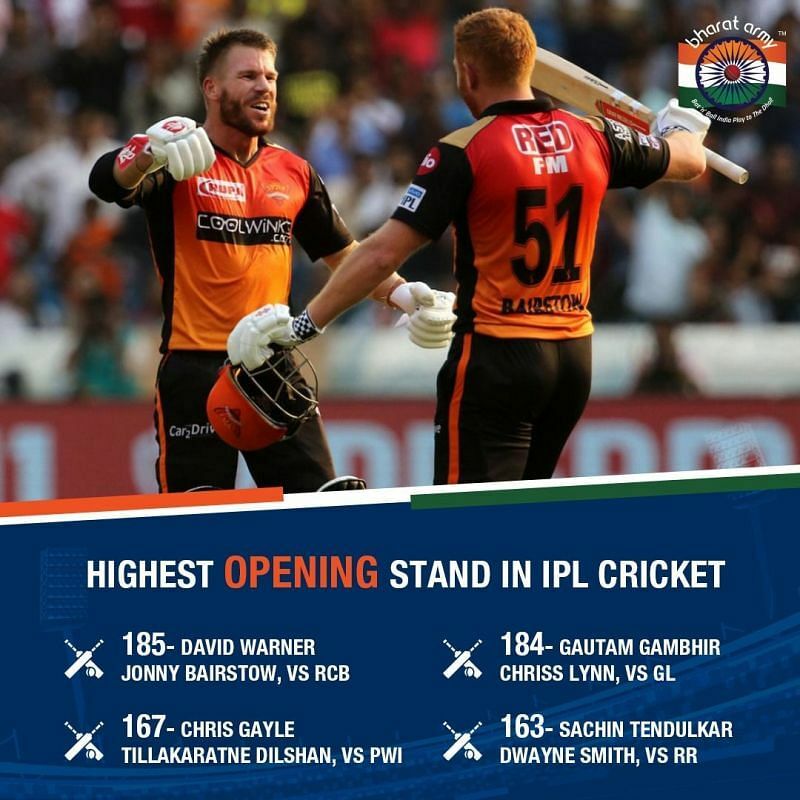 The first 13 days of the 2019 edition of the Indian Premier League has given us plenty of heart-in-the-mouth moments and in the process plethora of record-breaking feats have been achieved. If there ever is an IPL 'Hall of Fame' Chris Gayle will have his presence to the tune of his physical stature. Imposing. Swashbuckling. Such has been the impact of the 'Universe Boss' over the years in the IPL, that it is almost impossible to imagine an all-time IPL XI without the big Jamaican. His Brobdingnagian sixes have reverberated consistently across the eleven years of the Indian Premier League. Consistent is a keyword here. One of the thing that made Gayle stand apart from others was ruthless and consistent annihilation of the opposition bowlers. When on a song, rarely would Chris Gayle squander it away without having lit up the crowd with brutal and non-stop hitting. Gayle's template is simple. Respect the first spell before laying into the opponent once he has got his eye in. His peak years' in IPL cricket came while playing for the Royal Challengers Bangalore [2011-2017] where the swashbuckling left-hander scored in excess of 500 runs [608, 733 & 708] for three consecutive seasons [2011-2013]. 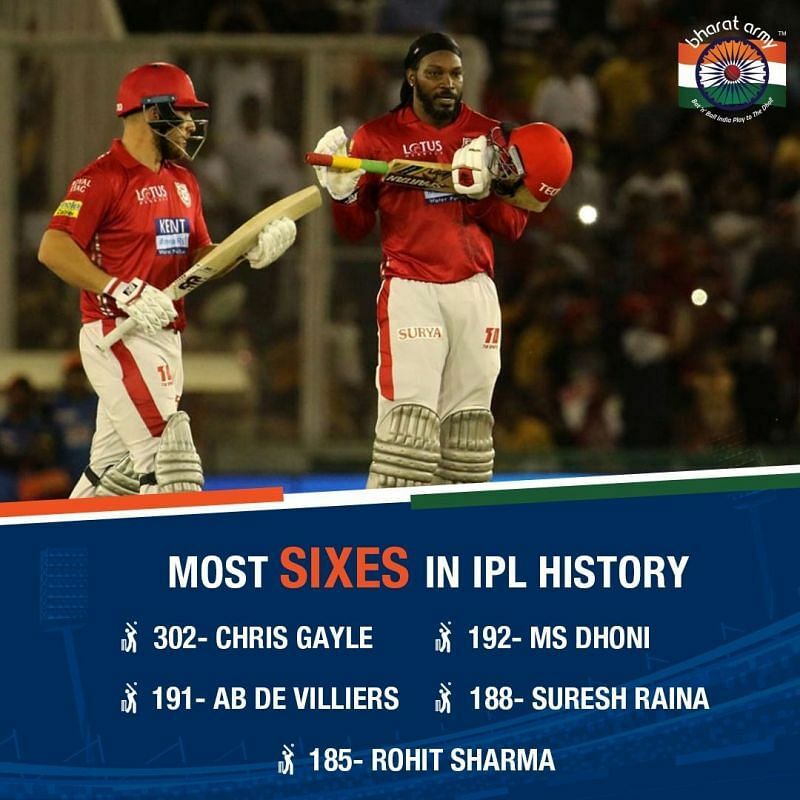 So, when the debate about the player with the most number of sixes in IPL history comes up, it shouldn't come as a surprise that Gayle Gayle occupies the numero-uno spot, but what boggles the mind is the difference between Gayle and the next-best. While Gayle sits pretty with 302 sixes, nobody in the lift thereafter has even crossed 200. MS Dhoni, with 192 hits to his name is at the second spot followed by AB de Villiers , Suresh Raina  and Rohit Sharma . 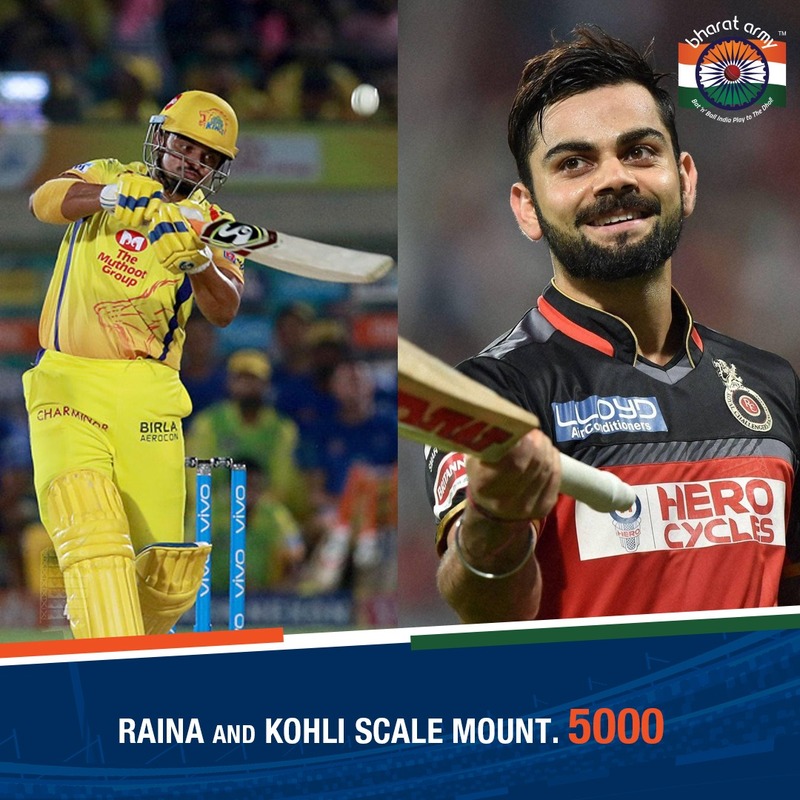 Leading into the IPL, one of the talking points was around this ongoing tug-of-war between Suresh Raina and Virat Kohli as to who will become the first batsman to score 5,000 IPL runs? Raina started the tournament at 4985 runs while Kohli  was 52 runs behind the magic number. So, when the first game of the tournament rolled around, this mini-battle added another intriguing flavor to the South Indian derby. With Kohli getting a chance to bat first in the tournament opener, it looked like the Indian captain will add another feather to his cap. But, on a rank-turner, Kohli holed out in the deep while trying to up the ante against Harbhajan Singh. The Challengers folded for just 70, giving Raina an ideal chance to achieve the well-deserved feat, and did so during his 21-ball 19. But, Kohli did not take much time either. During his innings of 46 against the Mumbai Indians, the RCB captain achieved a unique feat. He, not only joined Suresh Raina in the 5000-club but also became the first player to score 5,000 IPL runs for a single franchise. This is what happened with the 27-year-old mystery spinner from Tamil Nadu- Varun Chakravarthy. Chakravarthy came to bowl into the 2nd over of the match and was taken apart by Sunil Narine for 25 runs [1,6,2,4,6,6] in a single over- the most expensive over bowled by a bowler on debut. An Englishman and an Australian hugging each other in an Ashes year, the sheer thought of it would have been absurd in the pre-IPL era, but that's the beauty of franchise cricket- in particular- the IPL where cricketer's shed regardless of the nationalities combine for a common cause. The union of Jonny Bairstow and David Warner have been another such example where the duo have managed to put aside the animosity of the past to form one of the most fearsome opening pairs in IPL history. After notching up a back-to-back hundred-run opening stand in the first two games, Warner and Bairstow went a step ahead against the Royal Challengers, scoring individual hundreds en-route to the highest-ever opening partnership of 185, overhauling the record of 184 by Gautam Gambhir and Chris Lynn back in 2017. 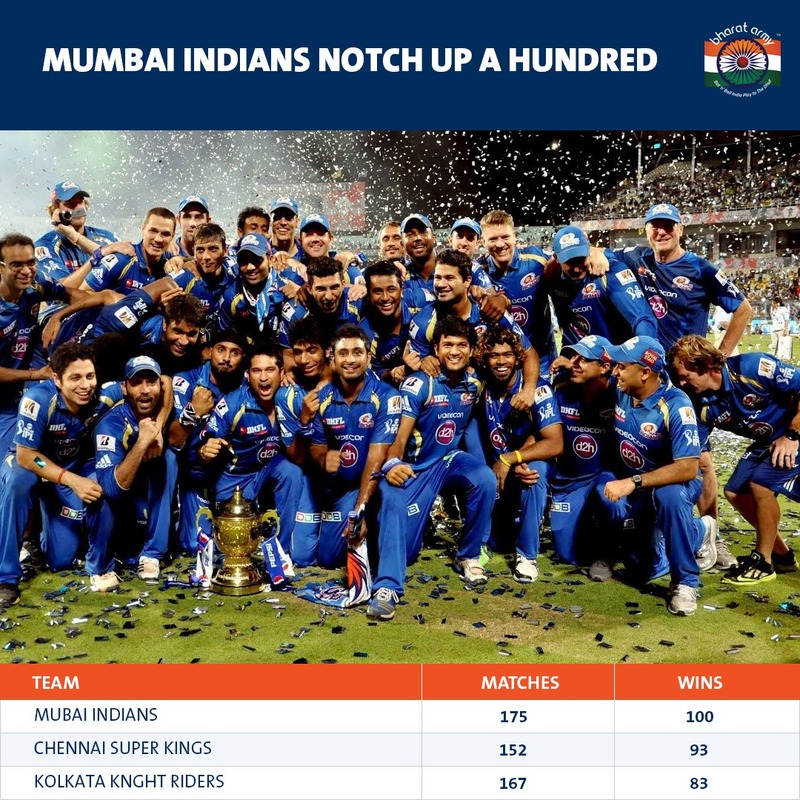 Three-time IPL champions, the Mumbai Indians added another feather to their cap when they became the first franchise to notch up 100 IPL wins. Their 100th win came against the defending champions, Chennai Super Kings when the all-round brilliance of Hardik Pandya [25 off 8 balls & 3-20] and an impressive bowling display- spearheaded by Jason Behrendroff's [2-22] opening burst, paved way for a 37-run win. The Mumbai Indians have thus far played 175 games, winning 100 and losing 75 of them constituting a W/L ratio of 1.333. 100 wins. 3 IPL titles. These are enough accolades to adjudge them as the most successful franchise in the history of the IPL. Right? But, sometimes numbers do not tell the complete story. At the second spot are the Chennai Super Kings with 93 wins in 153 games and a W/L ratio of 1.64. This after the Dhoni-led side did not feature in the 2016 and the 2017 edition of the tournament makes the achievement even more astounding. At the third spot is another two-time champion Kolkata Knight Riders' with 83 wins im 163 matches. Imagine you are a young kid posing for a photo with your hero, hoping to emulate him one day. A few years later you find yourself replacing your hero in the playing XI and end up with a record-breaking performance; that's the stuff of dreams, right? 20-year-old Sam Curran lived that dream during his record-break performance against the Delhi Capitals. Curran, who replaced Gayle at the opening slot played a brisk cameo of a 10-ball 20 but his moment well and truly arrived with the bowl later in the game. In a dramatic turn of events, the 20-year-old became the youngest cricketer to notch up an IPL hattrick as the Capitals' capitulated in spectacular fashion losing their last seven wickets for seven runs. Curran snared Colin Ingram and Harshal Patel in the 18th over to swing the momentum in KXIP's favor before cleaning up Rabada and Sandeep Lamichhane in the final over to end up with figures of 4-11. Apart from becoming the youngest cricketer to take an IPL hat-trick [20 years, 302 days], Curran also became the youngest overseas bowler to take a 4-wicket haul in IPL cricket. Andre Russell has 1,049 runs from 53 IPL games at a strike-rate of 185.33. No other batsman in the history of the tournament has gone past 1,000 runs at a strike-rate higher than the West Indian all-rounder. The all-rounder has been in quite some form in this tournament, hitting the ball at will. But, it is not only the strike-rate, what makes Russell the MVP of the KKR unit, is he has timed his assault to perfection. Every time KKR have found themselves in a spot of bother Russell has stepped up with match-turning performances. Russell's calculated assault [48 off 18 balls] on the SRH bowlers to help KKR chase down 54 runs off the last three overs or the 17-ball 48 [vs KXIP] to propel the team to a match-winning score followed by a 28-ball 62 [vs DC] to take KKR out of a precarious position [5-60] vindicate the impact he has had in this tournament thus far.